Jughead from UK. Sent 29 Aug 2010. My favourite shop in Eindhoven. Lots of choice and a friendly mentality. Probably the best within the town centre area and a straight forward walk back to the 'markt'. Ripear from Spain. Sent 14 Nov 2008. Jerry the Gooner from UK. Sent 12 Nov 2008. The Pink was raided last week and allegedly 250 kilos of hash and weed were found on the premises. Dutch law allows only half a kilo. The Pink is now closed for one year at least from November 2008. Jerry the Gooner from UK. Visited Oct 7. Sent 8 Oct 2008. On this visit the staff were very friendly and helpful. Seems to depend on whose working on what day. Had some good deals on Edewisse, Snow White and Nooderland Lights etc. All 1.5grams for 12 euros. Plenty of pre-rolled hash and weed joints available from 3-5 euros. Told on this occasion that the bouncer is purely there to check age on IDs. Stumbled upon it by accident and not easy to find. Nice interior but staff not very friendly. Nice selection on menu including many varieties not seen in other coffee shops. Bought a pre rolled Edelwise which did the trick. Nice indoor smoking room to the rear. Locals friendly. Noticed a large bouncer on the way out although why on earth they'd need one is anybody's guess? CoupleOfGermans from Germany. Sent 21 Apr 2007. This time we went to Eindhoven just to visit the coffeeshops, not for shopping. The Pink is easy to reach and you can even park close to it. The prices are ok, not too high. When we went they had: Shiva, Northern Lights, 2 Haze sorts. Can't say anything about the hash, since I didn't look at it and we don't smoke hash. The Shiva was 12€ for 1,4g and it had a good high, had some laugh-flashs and so on. The shop itself is very comfortable, there is an area where the roof is open and you can have a look at the sky (had luck when we arrived it was a blue sky with no clouds where you could lose yourself after smoking a joint). The staff was friendly like the last time we visited the shop, they gave my friend a good advice. Great shop! Tarro from Italy. Sent 14 Feb 2007. There is also the garden, in winter season! Yes because it is covered and warmed, but there are some air exchanger, so there is not the smoke inside this place of the coffee. 13 different prepared joint from 3 to 4.50 euros. Tokinjay from England. Visited 15 Nov 06. Sent 20 Jan 2007. We found this coffee shop eventually as it did seem a bit out of town centre (if you're walking!) but the bouncer on the door gave it away! Very retro and spacious with nice seating and tables, lots of people go in but it never seemed cramped or crowed inside with loads of things to keep yourself entertained! i.e. arcade games. Large selection of both green and solid at good prices. Not quite as friendly as some of the other shops but the atmosphere and selection of weed made up for it! This was our favourite! Doody from USA. Visited May 30-June 7. Sent 18 Jul 2006. Still the same great shop! Was performing once again around the corner at "Club Wilheminia," and stopped in for a good amount of time before the show. Place hasn't really changed much at all (see my more detailed review below). They still have the "Snuewhitte" on the menu, where they have all the buds on display, and it is still one of my favorites, and only seems to be available in these smaller towns. They have pre-rolled joints, the puur at E3.50 was well worth it. Also a great place to check up on the "In Crowd's" goings on. If you are in Eindhoven you must check this place out. Shelflife from USA. Sent 4 Jan 2006. Not only does The Pink have a bright, groovy atmosphere with its sculpted 60's interior and back patio, but it also has a Volcano Vaporizer, choice weed, and space cakes. The baristas (or whatever you call the workers) are laid-back and helpful even when busy, which is all the time, since it seems there is always a queue of tourists forming. The Pink is located right behind (when coming from the train station) the Bibliotheek, so it is a good stop for travelers who want to use email or just chill and read after their visit. We always found ourselves back at The Pink whenever in Eindhoven just for its comfort level and that sweet Volcano. Marc from Germany. Sent 28 Dec 2004. I visited the shop early in the morning. The barmen looked very tired but was very friendly. I bought some pre-rolled Joints (Noorderlicht and Haze). Noorderlicht was a bit too chilly but the Haze was very nice! Not often smoked such a Haze. The Pink is IMO the first choice for a good smoke in Eindhoven. TG from UK. Sent 12 Apr 2004. I managed to pop back to this lovely little establishment when I was in Eindhoven for a couple of days recently. I only had time for a couple of flying visits and I opted for ready rolled joints on both occasions. On the first day I had a Skuff Silver joint which was smooth and strong, so much so that I had to take momentary refuge on the benches opposite the shop until I was ready to continue on! The next day I bought White Widow and a Snow White ready-rolled joints which were both really nice. The traffic through the shop was brisk and in the 10 minutes I was there around 30 people came and went, so I guess this is a good indication of the quality of the product. It's all laid out in a glass case by the bar and there is a comprehensive range of weed and hash. They had Edelweiss, Northern Lights, White Widow, Snow White, Orange Bud, some variety of Haze and a mixture of dark (temple ball) and light hash (pollen). Deals were available for 6 or 12 euros and the ready-rolled joints I bought were 3.50 euros each. As previously stated, this is one of my favourite coffeeshops in all of Holland - definitely go there if you are in town. Michael from France. (living Eindhoven) Sent 20 Mar 2004. The most known coffeeshop of Eindhoven. Large choice but expensive prices and loud music. Gerri from Germany. Sent 25 Feb 2004. In my opinion the best Shop in Eindhoven. The pics @ the homepage tell the truth. Really nice and about 5 different kinds of weed, same about hash. They also offer space cake and cookies. Doody from USA. Sent 17 Nov 2003. I discovered "The Pink" back in 2000 when I was performing in the city centrum at "Club Willomenia," and boy was I glad that I did, a top notch establishment. I was walking down a narrow alley looking for the shop as someone told me it was in that direction. I ran into a fellow walking into his apartment and I asked him where the coffeeshop was. He just happened to be one of the carpenters who did all the amazing wood work in "The Pink," guess they won an architecture award or two for the design. He took me right there, set me up with the staff and had to go, I thanked him as he left and was then given the best service ever!!! The shop itself is very nice inside. Sleek and modern designs w/ a wavy wooden bench going all along one wall, with cushions and several low tables, a nice wood bar and stools on the other side. There is a ramp to a back area that has more places to sit, many sun lights and plants etc., very chilled atmosphere, stayed for an hour or so. They played a good mix of music, some trance and good pop music, w/ some rock thrown in. They also have outside terras seating available, very nice. The weed is displayed with actual buds in a display case, I chose the "Snow White" and it was amazing!!! Soaring type of high and a wonderful flavor, I had to get a pre-rolled "Pure" joint as well, it came w/ a warning, that made me laugh, but I can see why, this stuff will rock your world!!! They don't serve alcohol, but they have all the other drinks you would expect, I enjoyed an ice cold Redbull to wash down the "Snow White," excellent combination. Close to the city centrum there are several bars and shops around, also saw a 5 piece band playing that were all on a bike, very surreal and amazing experience. If in Eindhoven you must stop in here, one of the better shops in all of Holland, 4 stars. TG from UK. Visited April 2003. Sent 3 Aug 2003. I was in Eindhoven on a football tour and had a few hours to spare in the city centre one day and so I decided to try and find a nice coffeeshop to pass away the time. I knew very little about the place so I asked in a record shop and was told to check out the Pink. The directions I was given turned out to be pretty accurate but it took me about an hour to locate the place as it is on a main street but the shop sign is a neon light - great at night but not a lot of use during the day!!!! Someone eventually walked me to the door and I still walked past it!!!! Look out for the orange and green decor, that's the best advice I can give you. The shop is quite long but narrow, with a bar to the right, seats all down the left leading to a courtyard style back section. It is no-alcohol but that's not really a problem as the weed and hash was top draw. I bought a 5 euro bag of White Widow (the 3rd strongest weed according to the menu) and sat down in the back section enjoying the sunshine through the retractable roof!! I had nothing with me but was able to get Rizla and roach off the bar and they even sold individual cigarettes!!! The WW was really nice and gave a euphoric high that left me with a combination of nice stoned and paranoid stoned as I was feeling the effects after only one joint!!!! I struggled through a second joint and then aimlessly wandered off around the city centre for an hour of so!!!! I had some free time the next day so I headed back to Eindhoven again and went straight to the Pink. I wanted to check out the weed at the top of their menu - Edelweiss - but I had to buy a 12 euro bag of it as they didn't have the 5 euro deal?!?!? It was another nice smoke that hit pretty hard but the WW was comparable. I also bought a ready rolled joint of Snow White later on in the day which was again top quality. 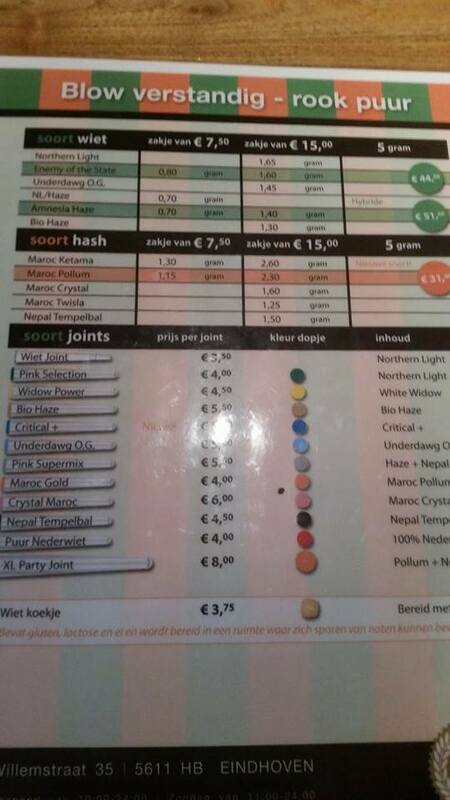 The prices were better than in Amsterdam, especially for the ready rolled joints. I liked the layout of this place, the decor was funky but chilled, the music selection was a mixture of cool dance and rock/indie, there was a nice mix of people coming in and out throughout the time I was there and the atmosphere was relaxed and easy-going. Definitely a place to go if you are in Eindhoven. It's reputed to be the most famous coffeeshop there and I can see why it is so popular. One of the best I have been to in all of Holland. Very nice coffeeshop, with good selection of products. There's maybe too much tourists. (Up-class). You can sit outdoors, nice in summer.